NEW GAME NOW LIVE! Furoticon: College Adventures! Free-to-play! Announcing the final Furoticon set: Climax 2! 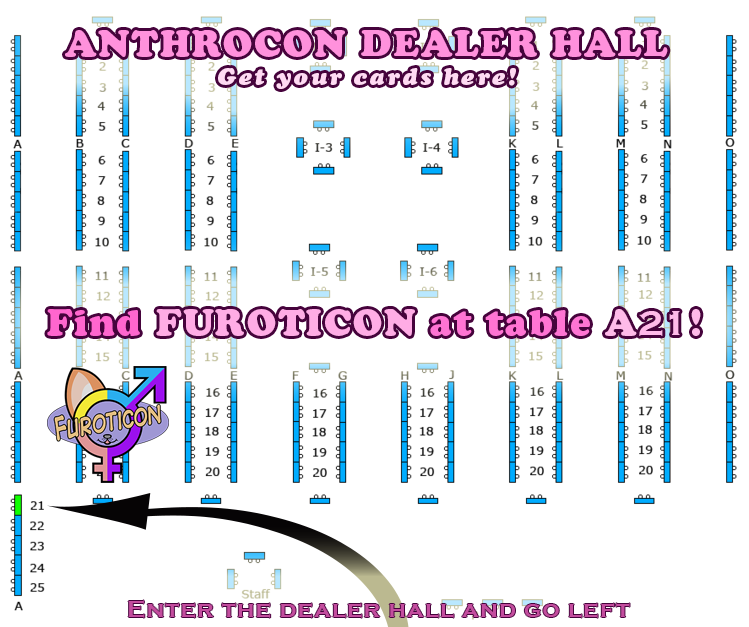 The big Anthrocon update! Out-of-print cards for sale! Anthrocon is just around the corner! 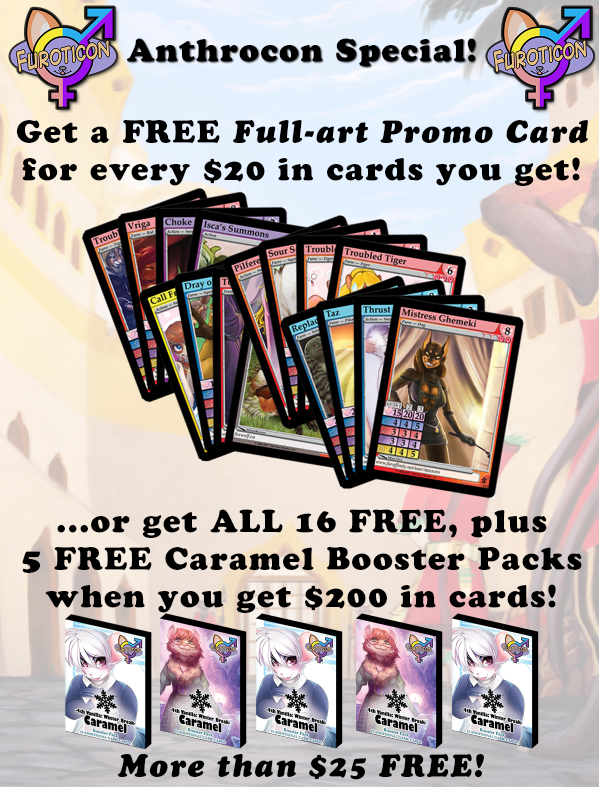 While you're there, pick up a sweet deal! And that's not all -- we will have out-of-stock cards available, too! Yes, FIRST EDITION CARDS! will be available! These are in very limited quantity, so if you want them, you'd better be quick! Once you've exhausted the dealer hall, stop by the gaming room to play some new games! Just look for the huge rabbit banner on the 4th floor of the convention hall. Damn I wish I could go. I'd love to be there for this. wish i could be there. i'd love to get my hands on some of those early sets. Wish I could be there. Sounds like some great stuff. Oh, man, I so wish I could make it. Looks like it'll be a blast! Hey there everyone! Time flies when you've got your hands full, and that's the reality we're in the middle of here at the Studio. We've got 25 excellent playtesters rocking the socks off our new prototype. They're not allowed to talk much about what's going on behind closed playtesting doors, but I can reassure all of you that the changes that they're suggesting and testing have sincerely revolutionized the original game that the design team had first come up with. It's all I can do to not spoil this part, as I'm pretty excited about it. What I can tell you is that this set will be set in a present-day city; our hero is very colorful and a snappy dresser; and with hard work comes great things ahead. I'll be back in another week or two give you news on further developments! Hope your April is turning out well! Would love to know more about the first main character and the setting to this game. i know i'm looking forward to seeing where this goes. Even if all we're hearing at this point is little snippets, I'm SO excited about how this game will turn out!